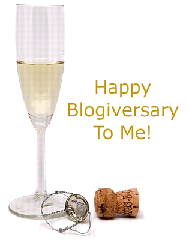 Today is Our One Month Blogiversary! Alright, so maybe celebrating by months isn’t very professional… But we’re excited about our one month anniversary here at The Mental Recession! Over 18,750 readers – that’s pretty good for the first month. Linked to from such prestigious conservative sites as – Instapundit, the Other McCain, Right Wing News, Linkiest, Big Government, Doug Ross, and NewsBusters. Currently sitting at 113 on the Technorati list of top U.S. political sites. Again, not too shabby for a brand new blog. We just wanted to say thanks to all those who have stopped in to read our ramblings, especially those who have taken the time to make comments and have their voices heard as well.